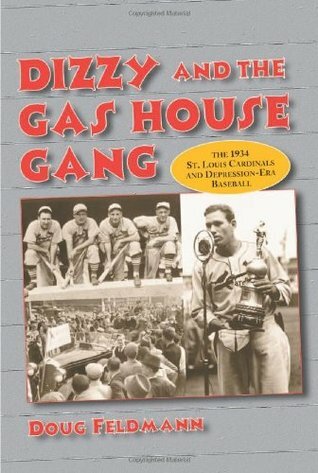 Dizzy and the Gashouse Gang: The 1934 St. Louis Cardinals and Depression-Era Baseball. By Doug Feldman. Jefferson, NC: McFarland and Co., 2000. The so-called “Gashouse Gang” was one of the most engaging major league baseball teams of the first half of the twentieth century and this book is an enjoyable recitation of its 1934 championship year. The St. Louis Cardinals had emerged in the mid-1920s as the best team in the National League but had declined somewhat since. A decade later, however, they roared out of the Midwest to claim the 1934 World Series. They were an attractive group with a colorful “country bumpkin” leader in Jerome (sometimes called Jay) “Dizzy” Dean, a young, handsome, tall-tale teller with even more self-confidence than his considerable skills allowed. “Ol’ Diz’s” younger brother Paul, christened “Daffy” by sportswriters, soon also found his way to the Cardinals. Behind them a talented supporting cast of Frankie Frisch, Leo Durocher, Pepper Martin, Burleigh Grimes, Joe Medwick, and Rip Collins, among others, filled out the team. These players brought results as they fought with other teams and each other to take the league pennant. During the 1934 Cardinals spring training camp, Dizzy Dean told a journalist that if the Cards let them start, that “me ‘n’ Paul will win 45 to 50 games.” When asked how many of the 50 Dizzy would win, he replied that he would win those that Paul didn’t. The Cards did win, and the brothers Dean did as well, Dizzy going 30 and 7 and Paul notching 19 wins and 11 losses. They pitched the team to the pennant, supported by a stellar cast of roughnecks, accounting for more than half of the team’s 94 wins. It was tight race for most of the year, and the Cards had to win 13 of their final 15 games to pass the front-running New York Giants in the final week of the season. Of the team’s final nine wins, Dizzy and Paul accounted for seven. Writers labeled the 1934 Cardinals the “Gashouse Gang” for their rowdy and daring play. In addition to team veterans Frisch and Martin (who had been shifted from the outfield to third base), the gang included shortstop Leo Durocher, leftfielder Joe “Ducky” Medwick, and the team’s leading hitter and slugger, first baseman Rip Collins, who in a career-best season led the league in slugging average and tied for first in home runs. In a seven game World Series, the Cardinals prevailed, and the Dean boys won them all, each getting a pair in the Cards’ triumph over Detroit. Doug Feldman’s entertaining story of this team focuses in four sections on (1) the depression era and baseball, (2) the team and how General Manager Branch Rickey built it, (3) the 1934 season and the place of the Cardinals and the Detroit Tigers in the two leagues, and (4) the World Series they played. Although Feldman wanders a bit as he seeks to discuss these major themes and inserts extraneous anecdotes, and there are a few errors of fact. Most troubling is that this is one of those journalistic accounts with neither notes nor bibliography, despite the fact that Feldman is himself an academic and fully aware of the conventions of scholarly apparatus. It does include an index, something indispensable in a work of non-fiction but still rare in too many sports books. This entry was posted in Baseball, History and tagged baseball, Burleigh Grimes, Dizzy and the Gashouse Gang: The 1934 St. Louis Cardinals and Depression-Era Baseball, Dizzy Dean, Doug Feldman, Frankie Frisch, History, Joe Medwick, Leo Durocher, McFarland and Co., Pepper Martin, Rip Collins, St. Louis Cardinals, World Series. Bookmark the permalink.